The velsycon GmbH is manufacturing hook interchangeable systems (COMBILIFT) and setting up systems. The COMBILIFT can pick up, set down, place up and tip over container and mobile silos of different sizes and standards. With that we offer transport solutions for different operational possibilities, for example disposal of waste, building industry, plastics, flours/powder, food industry, etc. A variable emptying system is rounding off our offer. We are selling worldwide and clients from all over the world benefit from our experience in special constructions and vehical construction. Because of our experience of the market since 1968 we are able to show our customers many-sided solutions for different problems and reasoned allround service. You can get vehicles, loading systems and container of one hand with a guarantee of function up to the compatibility of the points of intersection. 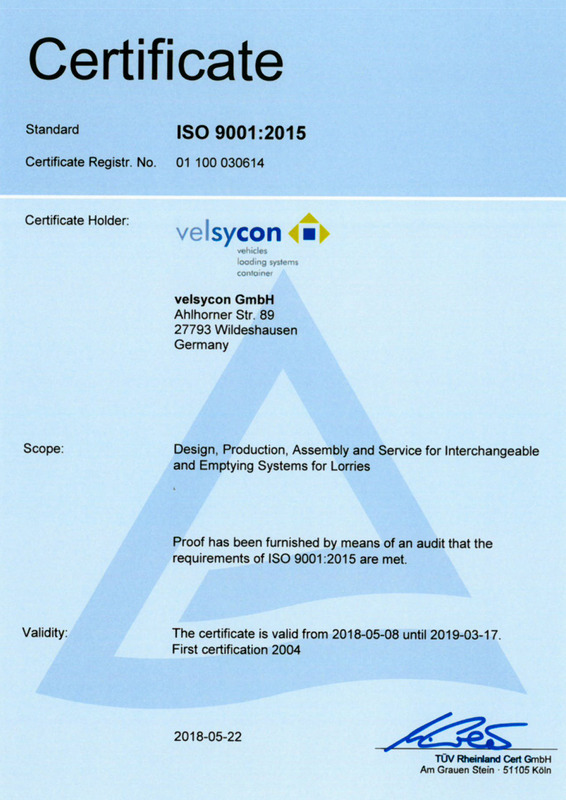 We are certified to ISO 9001:2008. Hüffermann Krandienst GmbH - crane rental, heavy loads and duty logistics, special vehicle construction, inspection service and rental plus trading with commercial vehicles. Hüffermann Transportsysteme GmbH is a manufacturer company for trailer systems for interchangeable container. The trailers are a supplement to velsycon systems to increase the customers efficiency. Besides trailers the product range includes also spezial bodybuilder solutions and vehicle disposal solutions. Hüffermann is leading in systems for load securing for interchangeable container. With an experience of more than 50 years Cycon is a reliable partner for design and production of hydraulic work units. Cycon has its own in house production for hydraulic cylinder. They are specialised on small series production and custom made cylinder. Meher velsycon is the exclusive distribution partner for velsycon products in India and the UEA. They sell mobile silos and silo placer systems coming from velsycon and assemble them in India in their own workshops. Furthermore meher develops and produces bulk carrier for the Indian market as a partner of the company herrmanns located in Cologne, Germany. Within the last ten years they became the market leader for these products.